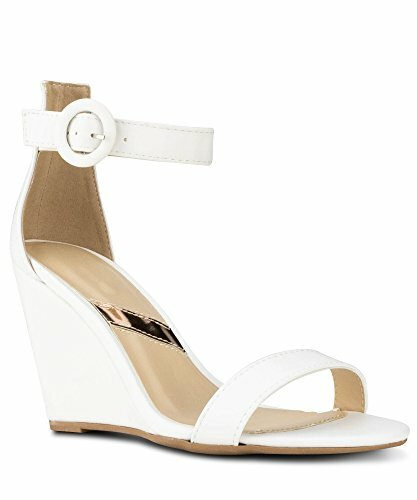 Slip yourself into a pair of MVE Shoes womens wedge find yourself in comfort with the soft interior and stylish design. 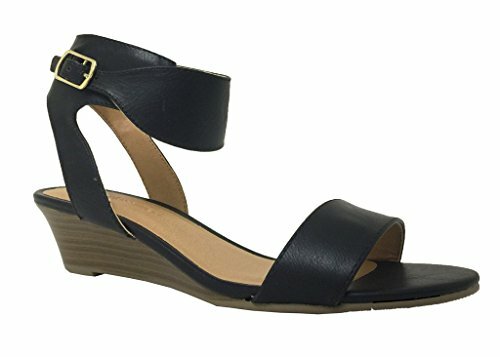 Size chart: Item Type: Womens Wedge Sandals Gender: Women Style:Fashion,Casual Size: 35/36/37/38/39/40/41/42 Color: Brown Black Khaki Gold Please measure your heel to toe length and choose accurate size according to the foot measurements. Size Chart: 36 EU-- 23cm (Foot Length)-- 6US Women 37 EU-- 23.5cm (Foot Length) -- 6.5 US Women 38 EU-- 24cm (Foot Length)-- 7.5 US Women 39 EU -- 24.5cm (Foot Length)-- 8.5 US Women 40 EU-- 25cm (Foot Length)-- 9 US Women 41EU -- 25.5cm (Foot Length)-- 9.5 US Women 42 EU -- 26cm (Foot Length)-- 10 US Women 43 EU-- 26.5cm (Foot Length) -- 10.5 US Women Notice: If you have any problem,please feel free to contact us,and we will reply timely. Our products are shipped from Chinese warehouse,please wait patiently,we will try our best to ship it. because of different light and different angles to see the color is a certain difference, I hope you can understand. Please choose size according to the size chart, Please allow a little error. 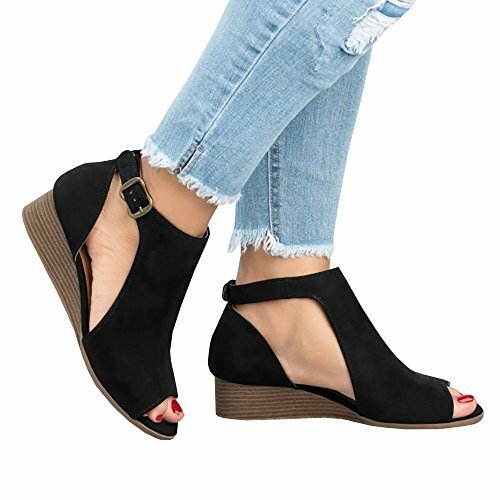 Item Type: Low Wedges Sandals for women Gender: Women Feature:Flats Style:Fashion,Casual Size: 36/37/38/39/40/41/42/43 Color: Black,Pink,Brown Size Chart: 36 EU-- 9.53 ins (Heel to Toe) ---- 5 US Women 37 EU-- 9.79 ins (Heel to Toe) ---- 6 US Women 38 EU-- 10.05 ins (Heel to Toe) -- 7 US Women 39 EU-- 10.31 ins (Heel to Toe) -- 8 US Women 40 EU-- 10.58 ins (Heel to Toe) -- 9 US Women 41 EU-- 10.84 ins (Heel to Toe) ---10 US Women 42 EU-- 11.01 ins (Heel to Toe) -- 11 US Women 43 EU-- 11.36 ins (Heel to Toe) ----12 US Women Notice: ------If you have any problem,please feel free to contact us,and we will reply timely. ------Our partial products are shipped from our US warehouse,and other are shipped from Chinese warehouse,please wait patiently,we will try our best to ship it. ------Wish you have a nice day! 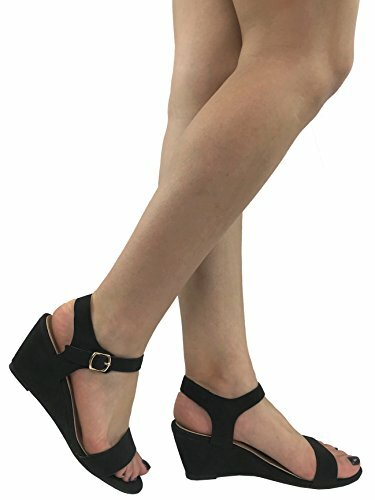 Lustacious Women's Open toe thick ankle strap wedge sandal. 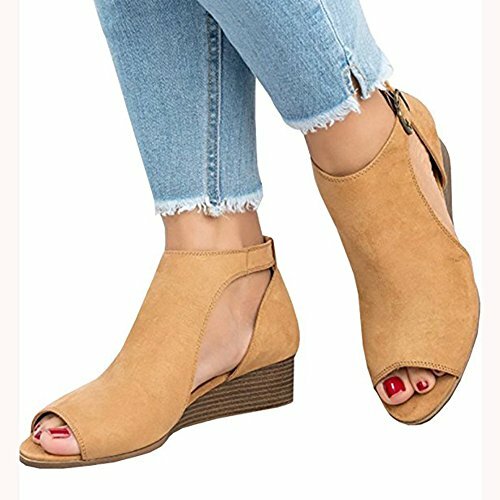 SySea Womens Low Heel Ankle Buckle Boots Slip On Cut Out Wedge Block Stacked Peep Toe Platform Ankle ----From young to young at heart, their shoes are on the feet of the fashion conscious consumer. Season after season, they have provided customers around the globe with the latest in fashion footwear. Size chart: Please measure your heel to toe length and choose accurate size according to the foot measurements. 36 EU-- 24cm (Foot Length)----- 5 US Women 37 EU-- 24.5cm (Foot Length) -- 6 US Women 38 EU-- 25cm (Foot Length)------7 US Women 39 EU-- 26cm (Foot Length)------8 US Women 40 EU-- 27cm (Foot Length)------ 9 US Women 41 EU-- 27.5cm (Foot Length)---10 US Women 42 EU-- 28cm (Foot Length)------11 US Women 43 EU-- 28.5cm (Foot Length) --12 US Women Notes: 1. The real color of the item may be slightly different from the pictures shown on website caused by many factors such as brightness of your monitor and light brightness. 2. Please allow slight deviation for the measurement data. 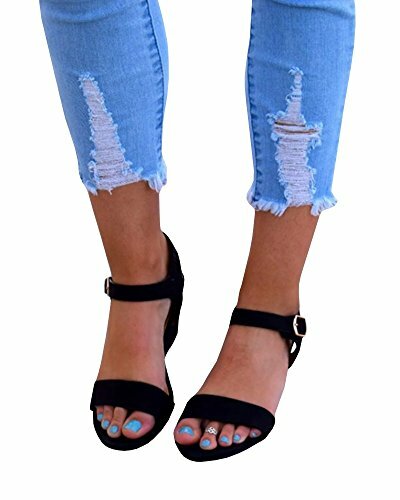 Classic wedge sandles pair beautifully with your summer dress or distressed jeans. This sandal is simple, but it holds tons of style! Very comfortable and will become your hot weather go-to for fashion and all day comfort. Quality faux leather upper that is soft will mold to your foot. About FISACERecord Your Inspired Fashion:FISACE walks you along Fresh Spring, Hot Summer, Golden Fall and Cool Winter;It is an attitude, a kind of gesture towards life to bring heart to commerce and become better origin of fashion inspiration. Our goal is to inspire and be inspired by cool girls all over the world.Please check the size chart above to ensure your order; Color disclaimer: due to monitor settings and pixel definitions, we cannot make sure that the color you see on your screen is as exact color as the product itself, there might be approximations of actual colors. However, we strive to make our colors as accurate as possible. 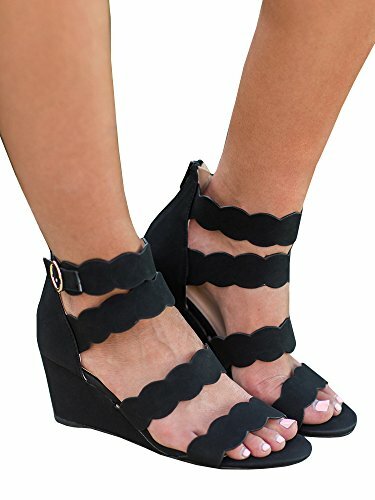 Compare prices on Wedge Open Toe Ankle Strap at ShopPlanetUp.com – use promo codes and coupons for best offers and deals. We work hard to get you amazing deals and collect all available offers online and represent it in one place for the customers. Now our visitors can leverage benefits of big brands and heavy discounts available for that day and for famous brands.